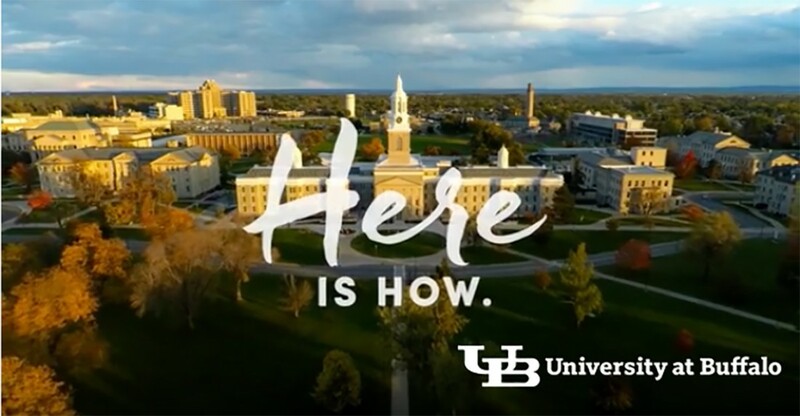 Let me return to the challenge – over its history, UB went by many different names, including University of Buffalo, SUNY Buffalo, and University at Buffalo. It may seem trivial, but the subtle prepositional change, “of” to “at,” when the school became part of the SUNY system has had people tripped up for years. Most media, even in the region, had trouble getting the university’s name right. Internationally, the SUNY Buffalo name carried more recognition, however a local college called SUNY Buffalo State has made it very difficult for a student from China or India to tell the two schools apart. Domestically, naming became further complicated when the Law School and School of Architecture and Planning adopted their own unique identities, focused on engaging their primary audiences. The biggest and most complex development came three years ago, when the university’s Athletic Director created a new identity – the New York Bulls – for all of the university’s sports teams. By supplanting Buffalo with New York, his idea was to demonstrate that this university was the biggest, and therefore should be the most visible, college sports program in one of the nation’s biggest states. There were multiple challenges with this approach (despite some kudos for thinking big). Several high profile sports teams already go by New York, including an MLS franchise called the New York Red Bulls. There are other high profile college athletics programs in New York, including Syracuse, who have long called themselves “New York’s team.” Finally, there is that city of the same name, #1 in population to Buffalo’s distant #2, with a far greater amount of visibility. This last point had Buffalo residents and university alumni fuming, having felt like the UB athletic department was leaving them behind for a “bigger,” more confusing name. Working with the university community, we and our partners, King Brown Partners, conducted research that concluded that most internal and external audiences familiar with UB would prefer the university to have a singular identity. They most identified with UB, and second most with University at Buffalo, although a handful of older alumni still knew it as University of Buffalo. Faculty, Staff, Alumni and Students alike expressed dismay at the fragmented image caused by these multiple identities, saying it adversely affected the pride they had for the school. We likened the effect to looking at oneself in a broken mirror – its impossible to make out the reality of who you are when the edges are so undefined. These findings, led to a major strategic effort to identify the common essence that unites the school. We concluded that to be proud of who you are includes pride in where you are from – and there are some real unique characteristics to Buffalo that needed to be expressed. We positioned the school as a tenacious and tight community of creative thinkers and doers, where individual ambition is amplified by the school’s many possibilities and supportive culture. Many of these characteristics are shared by the City of Buffalo – the city of good neighbors where a persistent and pragmatic spirit is leading the city through an amazing renaissance. This strategy, supported by our research, led the community to support a renewed focus on a singular identity, and to be proud of the unique and distinctive traits that make UB special. A new story platform, “Here is How,” (developed by our friends at Ologie) speaks to the ambition, possibility and supportiveness of the university community and inspires multiple new opportunities to demonstrate the school’s progress. It also explains why “at” (meaning here) is the correct preposition in the university name. A refreshed and focused visual identity system (also by Ologie), launched yesterday, brings the university, athletics, and all departments back into a coherent, navigable, and collectively powerful system. Time will tell how effective this identity system will be in building greater awareness and understanding of this unique university’s presence. It has certainly already inspired a sense of pride and community strength that had previously been missing. The press covering the new identity launch makes us optimistic that the pride that burns from within will catch on, now that it has a single, powerful identity.